"Horoscope Analysis - Mental Capabilities" through Systems'Approach, Beginners course in India Vedic Astrology, "Learn Astrology" and be your own astrologer, "Learn Astrology - Basics", "Learn Astrology- Theory", "Learn Astrology- Application", "Learn Astrology- Predictive Techniques", "Learn Astrology - medical Astrology, Learn business astrology." "Horoscope Analysis - Mental Capabilities" through Systems'Approach, "Learn Astrology" and be your own astrologer, Beginners course in India Vedic Astrology, "Learn Astrology - Basics", "Learn Astrology- Theory", "Learn Astrology- Application", "Learn Astrology- Predictive Techniques", "Learn Astrology - medical Astrology, Learn business astrology." "Learn Astrology" through Systems'Approach, "Learn Astrology" and be your own astrologer, Beginners course in India Vedic Astrology, "Learn Astrology - Basics", "Learn Astrology- Theory", "Learn Astrology- Application", "Learn Astrology- Predictive Techniques", "Learn Astrology - medical Astrology, Learn business astrology." Mental capabilities of a man like understanding, intelligence and analytic powers differentiate him from animals. The power of understanding helps in learning and power of analysis/discrimination helps in developing innovating techniques and problem solving skills. The purpose of the human beings can only be achieved if they have mental capabilities. The brain is the part of the body which provides fruition of mental capabilities. Therefore the brain, which is ruled by the first house and the sign Aries, is the most important functional part of the human body. The power of understanding is governed by the strength of the third and fourth house and the Moon. The intelligence is governed by the fifth house and the Sun and the power of analysis/discrimination is governed by the strength of the planet Mercury. CHART 1: Male born 31st March, 1960, 0759 Hrs. 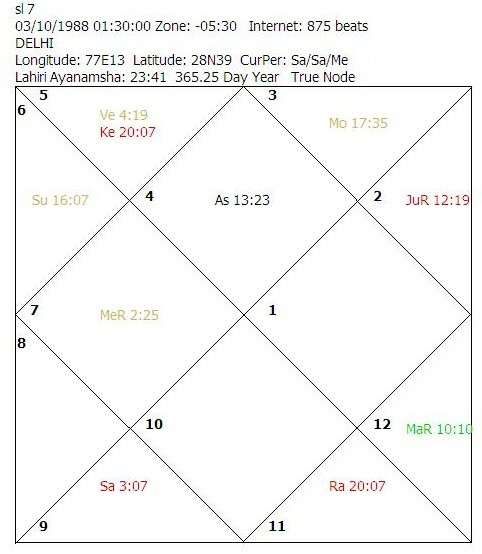 CHART 2: Male born 6th March, 1972, 1320 Hrs. CHART 3: Male born 5th December, 1976, 1005 Hrs. 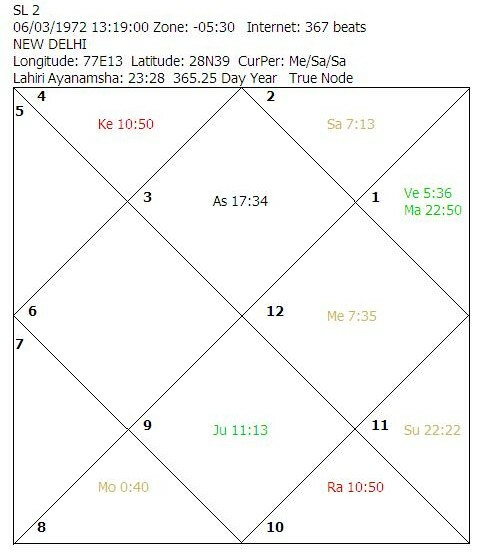 The sign Capricorn rises in the ascendant which means that besides Rahu and Ketu, the Sun and Jupiter become also functional malefic planets. The Moon is weak as it is in infancy and the most effective point of its house of placement is exactly afflicted by Jupiter. It becomes additionally weak for being closely afflicted by Jupiter. Mercury is weak as it is badly placed, in infancy and occupies the mooltrikona sign of weak Jupiter. Venus is weak as it is in infancy, it is exactly afflicted by Jupiter and its house of placement is also exactly afflicted. Saturn is weak as its dispositor is weak. 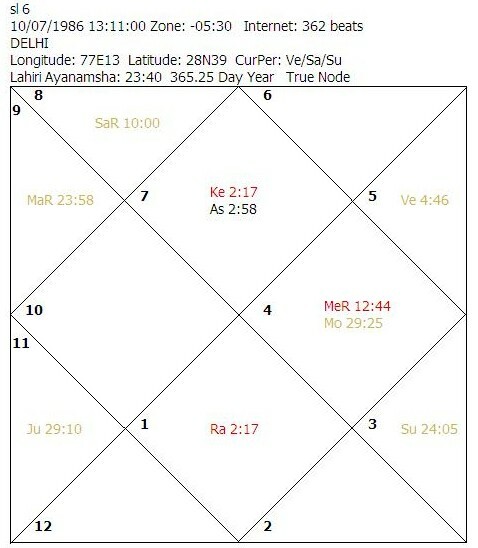 Jupiter is weak as it is in infancy, debilitated in navamsa and its house of placement is exactly afflicted by itself. 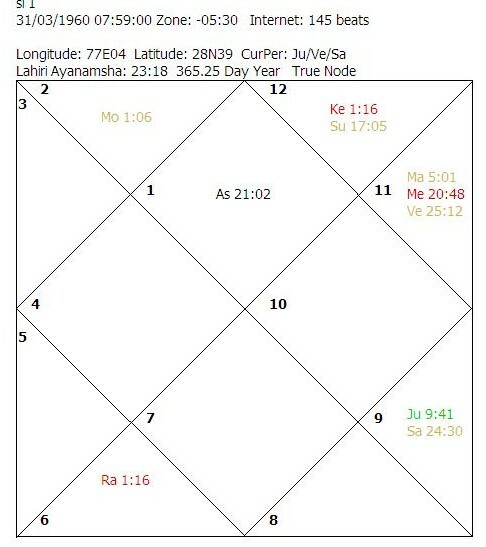 Mars, being lord of the fourth house, is weak as it is combust and the most effective point of its house of placement is afflicted by Jupiter. Mars is additionally weak for being closely afflicted by the most malefic planet, the Sun. 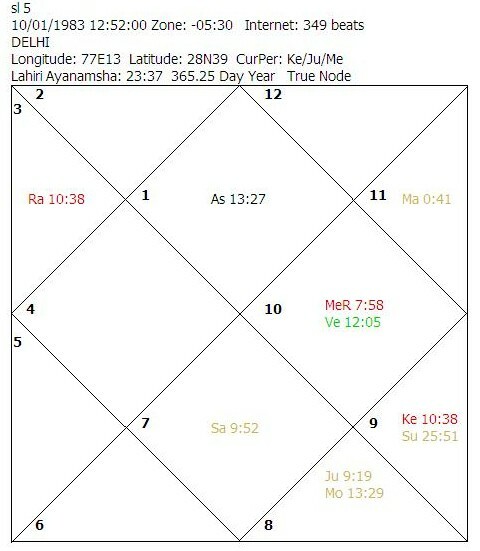 The Sun is weak as the most effective point of its house of placement is exactly afflicted by Jupiter. 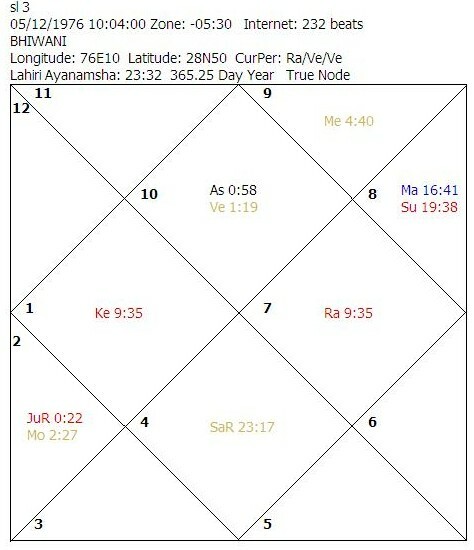 The most effective points of the ascendant and the fifth house are exactly afflicted by Jupiter. 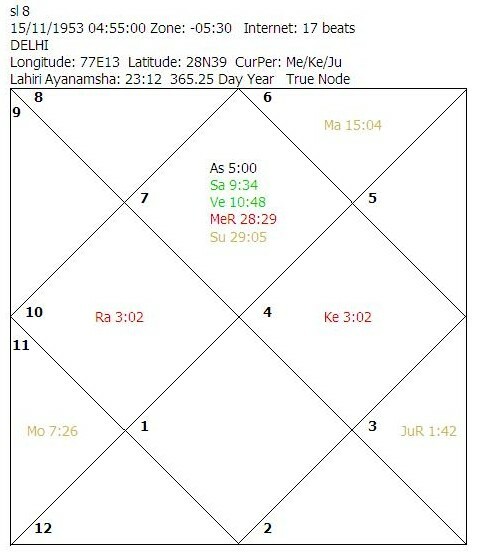 All factors, the ascendant, the Moon, Mercury, the Sun, the fourth house and the fifth house are weak. 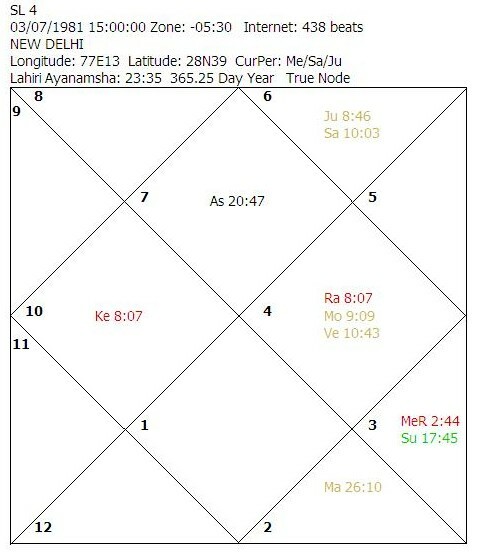 The native had the main period of the weak lord of the eighth house in operation at the time of birth followed by the main period of the weak and afflicted Moon and weak and afflicted Mars. The native had retarded physical and mental growth. CHART 4: Male born 3rd July, 1981, 1500 Hrs. CHART 5: Male born 10th January, 1983, 1253 Hrs. CHART 6: Female born 10th July, 1986, 1312 Hrs. CHART 7: Male born 3rd October, 1988, 0130 Hrs. CHART 8: Male born 15th November, 1953, 0455 Hrs.